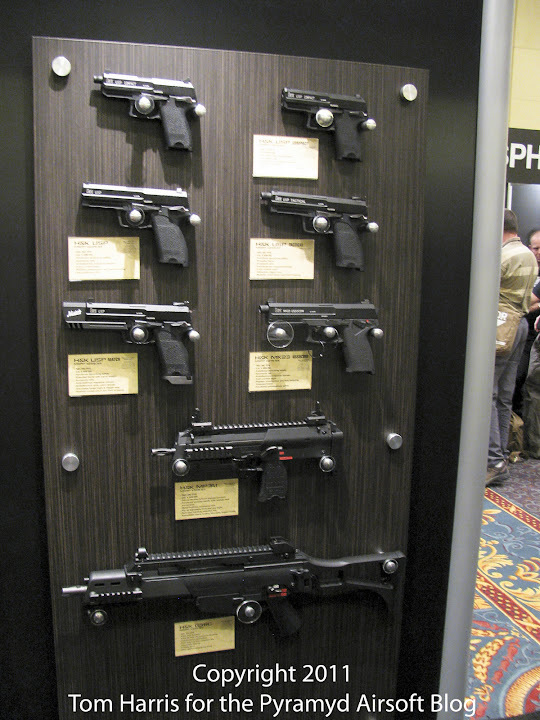 So, as you know, I stopped by the KWA Booth while soaking in as much of Shot Show 2011 as I possibly could in a very small window of time. 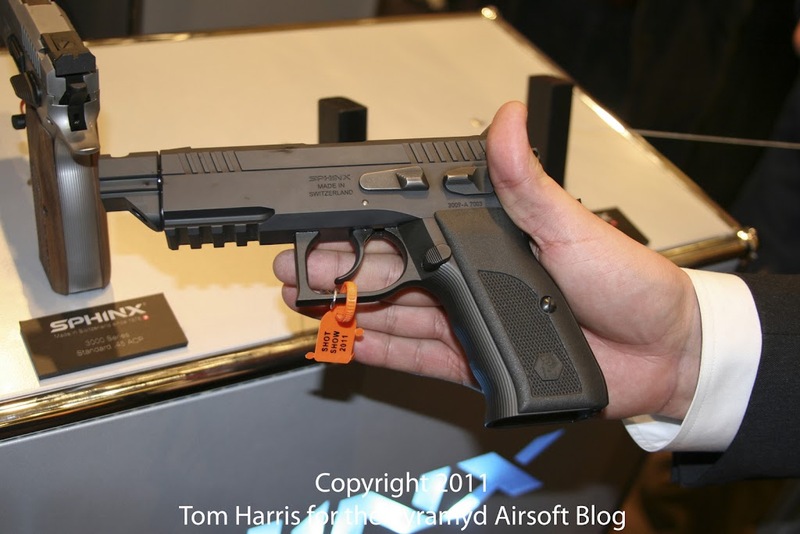 Just like the JAG Precision/Echo1 USA Booth, KWA had a metric ton of tantalizing new toy guns for which grown men like me would love to blow my emergency savings account** on. **You know, for emergencies like car trouble, unexpected medical bills, and new Airsoft guns that you just can't wait to own. Ze Germans are coming! Ze Germans are coming! 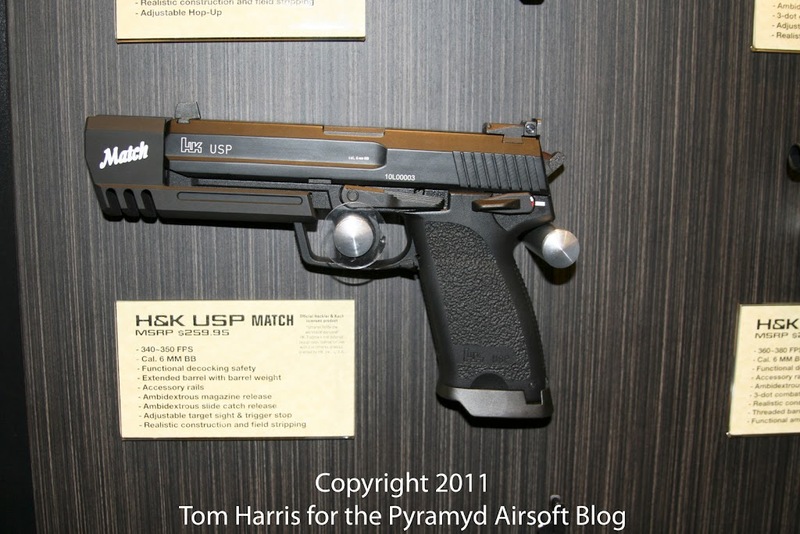 The KWA USP Match and I would be a match made in Heaven! <---Did you catch my cleverness? Actually, they (Ze Germans) have been here. But they're licensing us more cool stuff that you'll see in just a minute. 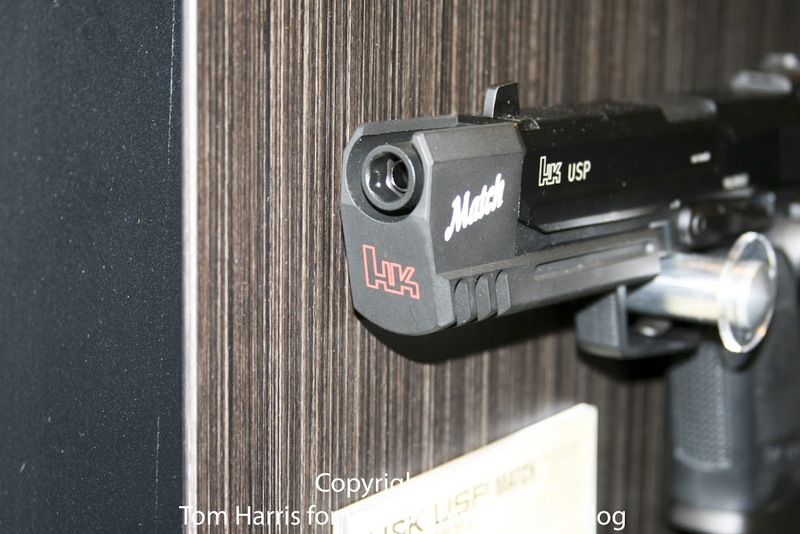 The KWA USP Match is one that I'd love to get my paws on! I realize the KWA H&K USP Match is not a new item by any means, but I'm the one with editor's rights here, so I'm gonna post it up like a boss cuz it's one that I've always wanted. Trades, trades, everywhere!!! 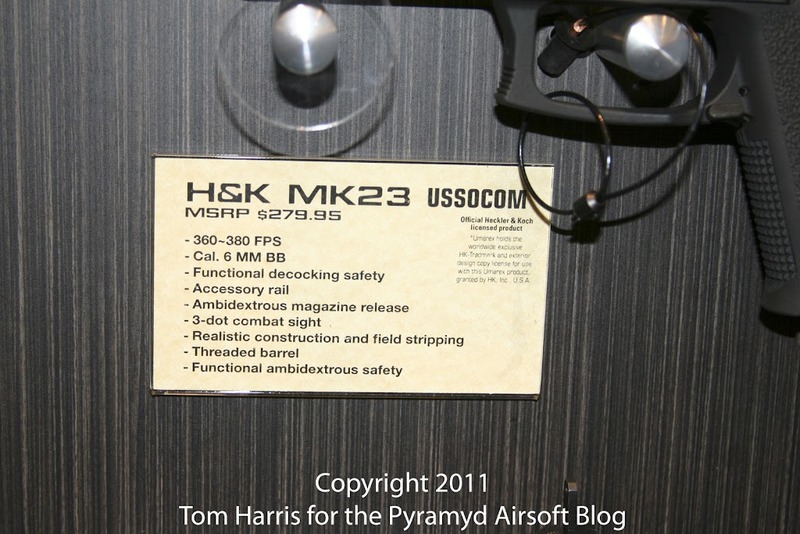 Michael Hon of KWA, who was very kind to me, even though he had no clue who the heck I was and why I was bombarding him with so many questions, made sure to point out USP Gas Blowback Pistol lineup featured legitimate H&K trademarks molded into the rubber grips of all their HK pistols. Let me back out for just a minute to show you the wall of guns we're dealing with at the moment. 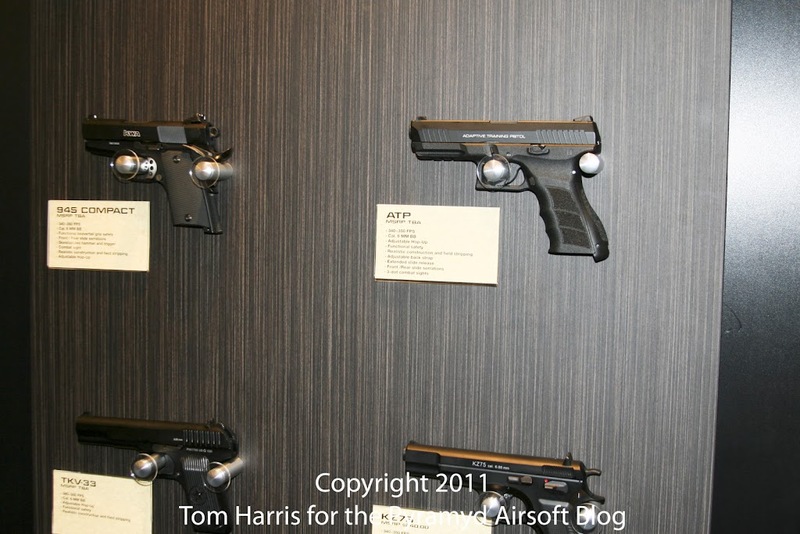 This was KWA's dedicated wall for all their Heckler & Koch (H&K) guns. It was really quite breathtaking to witness firsthand. Let me tell you (and I will). You can see KWA has got a number of USP models now, along with the famous KWA MP7 Gas Blowback Airsoft Submachine Gun, as well as their G36 Commando Airsoft AEG. 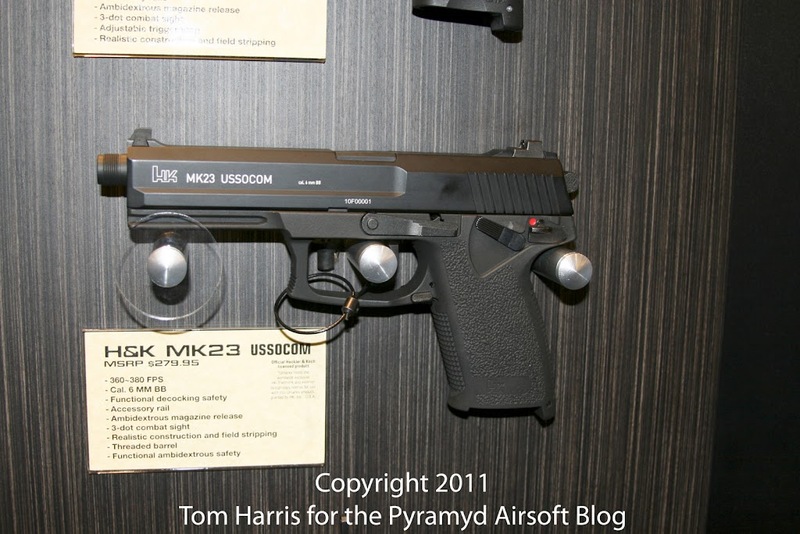 One model in particular that I think many people are excited for, including myself, is the arrival of the KWA MK23 SOCOM. Fully licensed HK trades thanks to the fine folks at UMAREX are just the icing on the Airsoft cake here. The KWA H&K MK23 SOCOM has all kinds of goodies built in. Here's a close-up of the description card for your convenience. 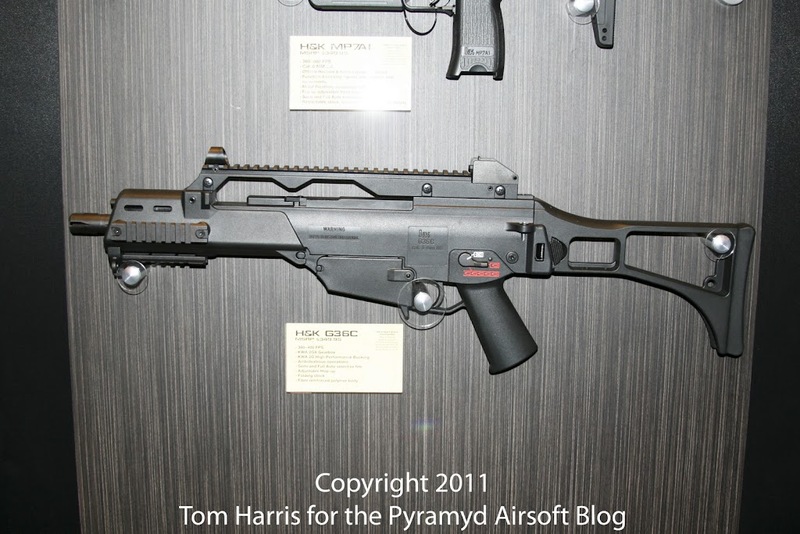 The KWA H&K G36C Airsoft AEG, as pictured below, with licensed Heckler & Koch trades stamped on the receiver area, courtesy of Umarex. Had to throw this one in here: the KWA 1911 Mk II from their Professional Training Pistol (PTP) line. Just in case you need some 3-round burst gas pistol action in your life, snapped a shot of the KWA M93RII with KWA's signature NS2 gas system internals. I love the number three and I love things that are round. 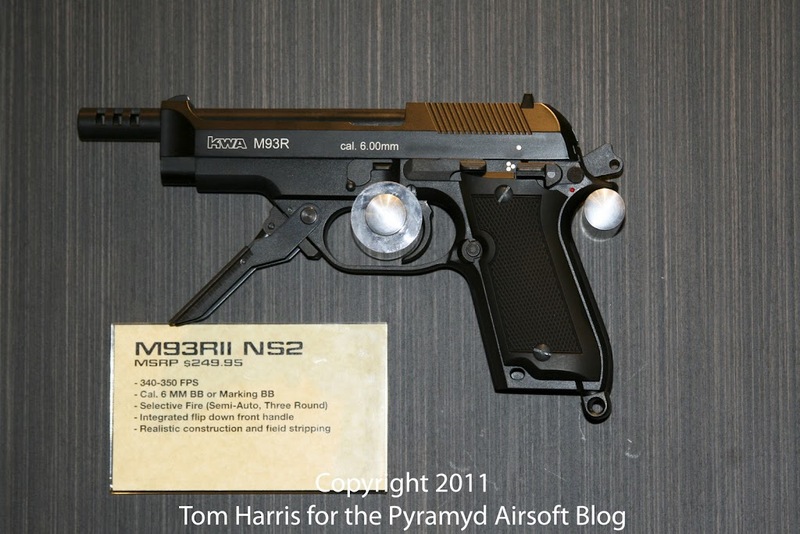 So naturally, when I saw that KWA's M93RII featured a three-round burst selection, I just about pooped. I'm glad I didn't poop myself, though. Then I would no longer be able to refer to this monstrous gun convention as "Shot Show 2011," but rather as "[rhymes with spit] Show 2011". And people wouldn't want to be friends with me after that. Plus, I didn't have a change of clothes handy at the time. It would have been all bad and I'm glad I kept my composure. Ah yes. Here we go. The 945 Compact, Adaptive Training Pistol (ATP), TKV33 and KZ75 Airsoft Gas Blowback Pistols from KWA. While I do give due credit to the other three Airsoft pistols in the photo, I'm going to ignore their existence for the time being. 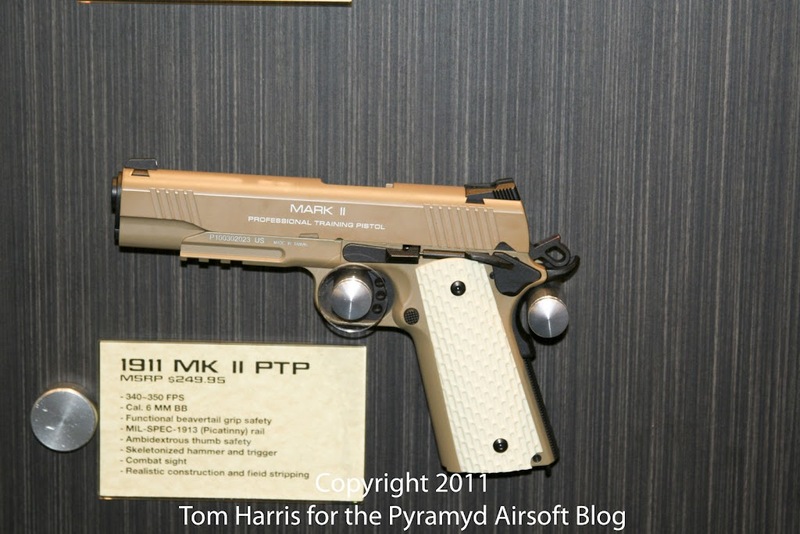 Number one, right off the bat, I dug the look of the KWA's new Adaptive Training Pistol (ATP). And then, once I got the scoop on it from a gentleman I like to call, Mr. Allen "Allizard" Lau, who probably needs no introduction, I increased my level of "dig" that which therein I felt towards it. 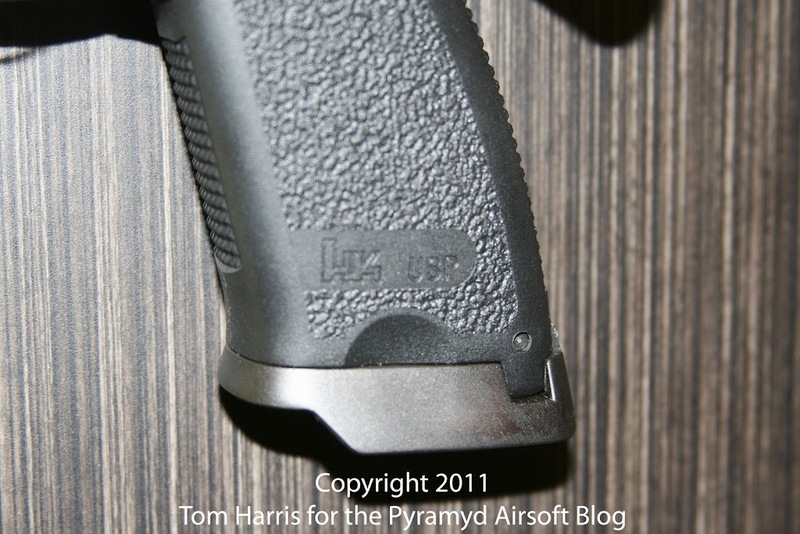 Shares some similarity with the Glock G17, including the use of the same Glock gas magazines. It even fits into molded Glock holsters, so there are a ton of great options already out on the market compatible with the ATP. I am particularly interested in picking up a 5.11 Thumbdrive holster + thigh rig, maybe even a right and left hand rig for dualies. Last but perhaps most impressive, was the high degree of ergonomical comfort when holding the ATP. The molded grip feels great in the hands of the operator (that's what she said!!!). In an ocean of new KWA products, I'm perhaps most excited for this arrival, save for one other item*, due out later this year. Alright. 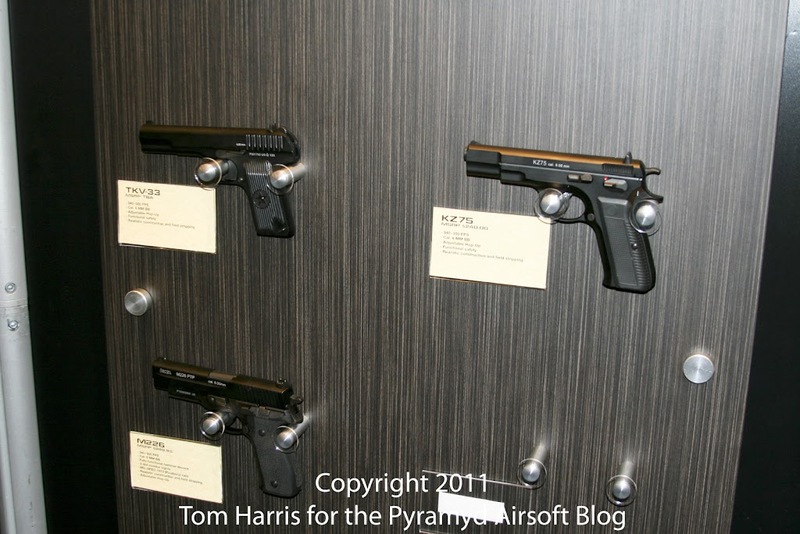 The foreigners: The TKV33, KZ75, and M226, which of course, is a Sig Sauer replica. All GBB, All, of course, KWA. Remember that "one other item*" I was most excited for that I mentioned in the ATP section? No? Well I don't remember certain aspects of my late-night/early-morning adventures running around the Las Vegas Boulevard Strip, so I won't hold it against you this time. OK, that last part about cutting off the Director of Marketing for KRISS simply to see an Airsoft version of the real steel version we were just discussing MAY have been a bit embellished. 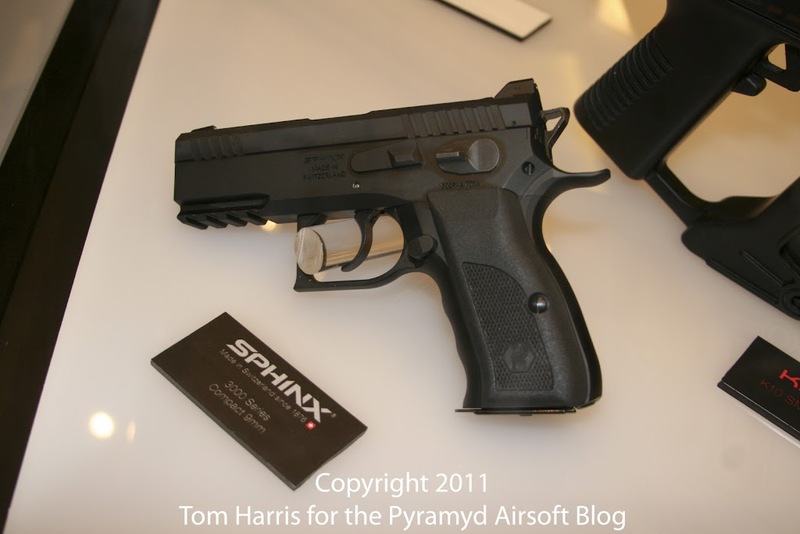 But looking at the photo above of the KWA SPHINX Compact 9mm, could you blame me if I DID pull off such a ballsy maneuver? I actually waited until we had mutually agreed to end our discussion before heading back to the KWA booth. But you can see how much better it makes the story if I say that I just rudely interrupted Christophe without so much as an ounce of concern for his feelings and ran off to see a toy gun prototype at another booth. Alright, that'll do for now.